Rawlins County Health Center’s goal is to provide patient-centered quality healthcare to you and your family. We provide accessible, comprehensive, personalized, and friendly services to our community of Atwood, as well as the surrounding area. We welcome new patients and offer same day appointments for most appointment types! Please call our center today to schedule your appointment with one of our providers. Rawlins County Health Center’s Swing Bed Care staff understands the special circumstances of people who need comprehensive rehabilitation. Swing Bed Care at RCHC is under the direction of our physicians, physician assistants, registered nurses, licensed practical nurses, certified nursing assistants, physical therapists, physical therapy assistants, a registered dietician, pharmacist, licensed social worker, a social and activities service designee, and respiratory therapist as needed. Support services at our health clinic are planned for both “Skilled” and “Intermediate” patients. The swing bed program provides a service for rehabilitation and care for patients who have completed Acute Care hospitalization. Rooms are also available for extended private pay patients who require 24-hour nursing care. The team recognizes the important role of the family in the treatment program and strongly encourages family involvement throughout the recovery process. Education for patients and family members is an essential component of the program. Baths are given and linens changed every other day and as needed by nursing staff. Quality care and patient safety are our primary consideration. The emphasis of nursing care is to maintain or improve the physical, psychological, social, and spiritual well-being of each patient. This is carried out under the supervision of professional staff members familiar with medications and special treatment procedures. We encourage patients who have been treated for an illness or had procedures completed in a larger hospital to return to RCHC for any needed care services. Example: IV therapies, rehab from hip and knee surgeries, or other surgery that requires rehab or skilled care monitoring. A Care Team Meeting will be held each week the patient is in Skilled Care. Patients and their families are encouraged to attend these meetings to help plan, evaluate the care being given, and the patient’s progress. Discharge planning is particularly important to the swing bed patient. The discharge planning is started on admission and involves the entire RCHC health care team. Skilled patients have their level of care evaluated weekly at the Care Team conference to determine whether or not they meet skilled criteria, to set patient goals, and plan for their discharge. Patients are notified 24-hours in advance of a change in the level of care. Patients are assisted with nursing home placement as needed. Nursing home C.A.R.E. 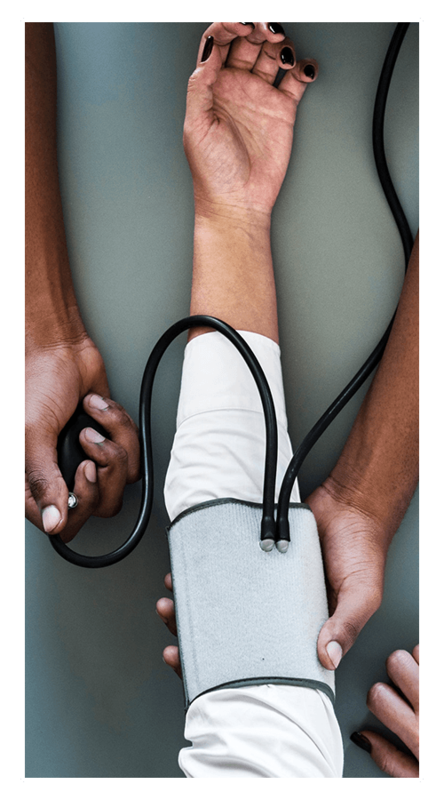 assessments, health referrals, obtaining hospital equipment for the use in the home, outpatient physical therapy, and instructions for the family in home care for patients. Physician referral is required, and we work closely with the patient’s physician to assure optimal results. Medicare and Medicaid and some private insurance plans cover the services outlined here. This program allows your physician to “swing” your level of care from “Acute” to “Skilled” rehab while you spend time in the hospital. Swing Bed Care is designed to provide “balance” and fill the gap between the hospital and home. The term “Swing Bed” refers to a hospital bed in a small rural hospital that can be used to provide either Acute Care or Skilled Care. The bed is a regular hospital bed and does not “swing. 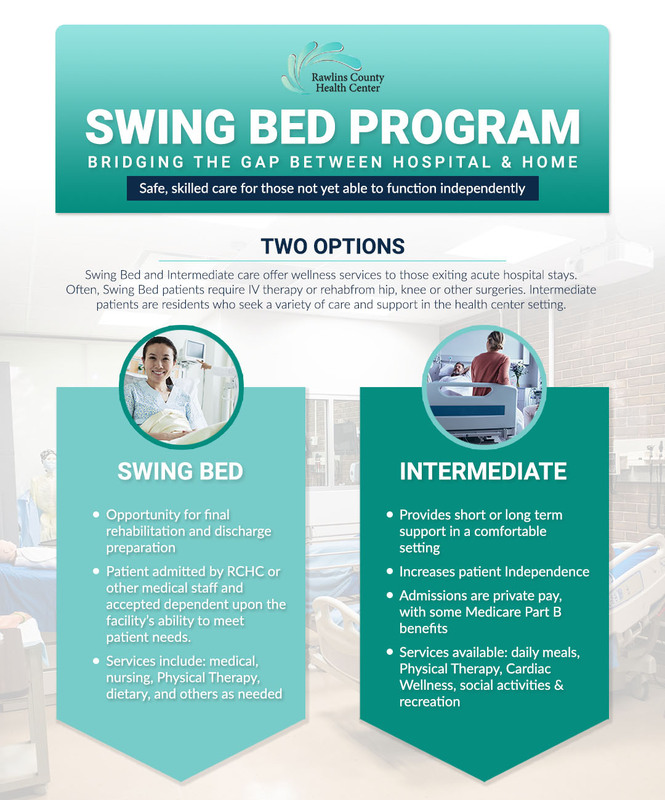 The Swing Bed Program may answer your needs when you no longer need Acute Care services, but may need more help before you can care for yourself at home. The RCHC program provides a unique opportunity for health care Providers to maintain continuity of care for patients requiring extended care following acute illness. Swing Bed Care offers cost effective, safe, skilled care for individuals who don’t need full hospitalization but cannot yet function independently. Both skilled and Intermediate care, with an emphasis on rehabilitation, can be delivered in a Swing Bed setting. It provides an excellent transition between the Acute Care hospital and discharge to the patient’s home or a nursing home. RCHC Swing Beds provide an opportunity for final rehabilitation and discharge preparation. Medicare and Medicaid benefits were authorized in August of 1984 by the United States Congress, following the evaluation of four successful Swing Bed Programs. Many private insurance plans may also cover Swing Bed Care. Medicare benefits are allowable at the Skilled level of care. For more information on insurance coverage for any level of care, call 785-626-3211. These candidates are patients who receive care that requires the daily direction of a Physician and management of acute illness or condition. Criteria set forth by Medicare – The patient being admitted to skilled care must have three consecutive qualified acute care days. The skilled care patient’s needs and/or problems are the qualifying criteria. Criteria for skilled care requires that the patient’s problems are complex enough to require the arrangement of a professional. Professionals are RN’s, LPN’s, Physical Therapy, Occupational Therapy, and Dieticians. Medications, linens, housekeeping, nursing care, room, and board are provided for Skilled Care residents. Families or designated persons are encouraged to provide personal care items such as kleenex, lotion, toothpaste, and toothbrush, etc. The Rawlins County Health Center will provide these items if needed at an additional charge. These candidates are patients who require long-term maintenance at a lower level than Skilled Care. These admissions are private pay. Some Medicare Part B benefits may be allowable at this level. The patient must provide home medications from a pharmacy of their choice. Families are encouraged to provide personal care items. Patients may also be admitted to Intermediate care in conjunction with Hospice Services, Inc. These candidates are residents who desire to stay in the hospital for an indefinite period of time following the expiration or non-eligibility of insurance benefits or acute care/ skilled care benefits. Admission is ordered by a member of the RCHC medical staff. Admission is accepted if RCHC has facilities and staff to meet the needs of the patient. The Director of Nursing and/or Swing Bed Coordinator will be available to answer questions about any patient care, rates, charges, or qualifications. The Business Office or Nursing Staff will assist the patient in signing swing bed forms, including the Patient’s Bill of Rights. Skilled Care—The health care Provider of the patient’s choice will visit a minimum of one time per week and as needed. Intermediate Care—The health care Provider of the patient’s choice will visit one time per month or as needed. A health care Provider will be available at all times for emergency situations. If a patient develops a problem or has a need to see a health care Provider, the Nursing Staff will communicate this to the health care Provider and appropriate action will be taken. In emergencies, the ON CALL health care Provider will be contacted if the patient’s regular health care Provider is not available.